Rest Day 5/4/14: What are your favorite sides? Share! Below is a great recipe from Alex Black of Wicked Good Nutrition. Sides can really pump up a meal especially if they’re sides you can get excited about. Share your favorites! 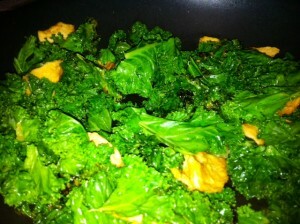 Kale is a nutrient rich green vegetable, and makes a great side dish for your chicken, beef, or fish. Raw kale can be on the more bitter side (depending on whether or not you’re a bitter taster), which is why it’s often added to smoothies and juices, although some enjoy it as part of a salad. This recipe adds a little sweetness and makes 2-3 servings. This entry was posted in Motivation, Nutrition, Our Mission and tagged brain power, colorful foods, food, fruits vegetables, healthy-living, nutrition, people, personal experiences, workout nutrition by Renegade Rowing. Bookmark the permalink.